Leverkusen/Jhagadia – LANXESS is continuing to expand its Indian production site in Jhagadia, Gujarat state. The specialty chemicals group is underlining its commitment to the subcontinent by inaugurating three new plants this month to serve the growing India market. LANXESS has invested over EUR 70 million and created roughly 300 new jobs at the site. Today, the company’s Semi-Crystalline Products business unit started production at the site’s new plant for high-tech plastics used by the automotive industry, including leading car manufacturers Tata Motors, Volkswagen and Ford. Furthermore, the Material Protection Products business unit inaugurated a plant for biocides used in the construction industry. LANXESS subsidiary Rhein Chemie also started up a plant for release agents and additives used in the manufacturing of tires and rubber products. Both plants were relocated from a former site in Madurai, Tamil Nadu state, during the course of last year. The site already includes a facility for ion exchange resins, used in water purification, and a rubber chemicals plant serving the tire and rubber processing industries. Both started up production in 2010. The Indian economy is expected to grow by eight percent this year, driven by strong demand for premium products for the automotive, tire and construction industries. Global automakers, as well as their suppliers, are already active in India and are investing in new plants on the subcontinent. The growing middle-class in India is driving the trend towards greater mobility. The country’s automotive industry is expected to grow by 9.5 percent this year. LANXESS is tapping into India’s growth with its flagship brands for high-tech plastics Durethan (polyamide) and Pocan (polybutylene terephthalate), which represent a lighter-weight plastic alternative to metals. In addition, they enable carmakers and car parts suppliers to realize considerable savings by providing less costly production methods and easier assembly. LANXESS will be showcasing its high-tech plastic products and innovative technologies at a 300-square-meter-booth at the Plastindia Exhibition from February 1 to 6. Axel C. Heitmann, Chairman of the Board of Management, and Board Member Werner Breuers will be attending. The material protection products manufactured at the new plant include the Preventol range of antimicrobial compounds. These preserve paints, coatings and plasters and protect materials like wood from bacteria, fungi and yeasts. LANXESS is a leading producer of biocidal active ingredients and formulations. The annual capacity of the plant is 2,000 metric tons. Rhein Chemie will produce the pre-dispersed rubber additive Rhenogran and the environmentally-friendly release agent Rhenodiv in Jhagadia. Rhenogran is used in the production of tires and other rubber products. Rhenodiv is used to prevent rubber vulcanizates from sticking to their molds, thus enabling smooth, automated processes. The annual combined production capacity of the plant is 2,500 metric tons. Jhagadia is LANXESS’ second largest production site in India after its site in Nagda in Madhya Pradesh state. Jhagadia is a state-of-the-art, 18-hectare-site and the production facilities have been set up with the most recent technology. It also offers many geographical advantages for the products sold by LANXESS. It has excellent links to international ports, which ensures a reliable supply of raw materials for the production facilities as well as rapid delivery to customers outside India. Jhagadia is the model of an environmentally friendly site. Strict standards are applied throughout, and wastewater is pre-cleaned in a separate wastewater treatment plant before being released into the chemical park’s final treatment system. Furthermore, LANXESS uses a highly efficient, natural-gas-powered cogeneration plant for the company’s own energy needs. LANXESS not only expanded its Jhagadia site this month, but also opened its new head offices in Thane, Maharashtra state. It will be home to 225 employees and was designed in accordance with LANXESS’ commitment to sustainability. For example, energy-efficient glass was used in the windows, and the building includes a rain water harvesting system. LANXESS currently employs roughly 860 people in India and achieved sales of EUR 184 million in the first nine months of 2011. 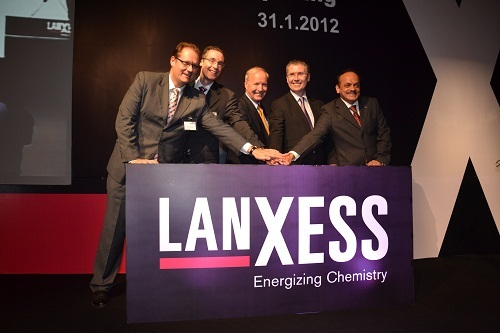 LANXESS’ commitment to India complements the “Year of Germany in India 2011-2012”, which was officially opened by German Chancellor Angela Merkel in New Delhi in May 2011. During this series of events, Germany will stage presentations in seven major Indian cities to highlight its role as an innovative, creative and sustainable partner for India. LANXESS will be showcasing its high-tech products designed to meet the challenges posed by the ongoing urbanization of in India at the exhibitions in Mumbai and New Delhi.